Campbell has been with Manchester City since February 2016. MEGAN CAMPBELL CAN take at least one positive from her latest injury nightmare — she has been here before and come back even stronger. The Drogheda native could barely believe her luck when she returned from the US after completing a sports scholarship at Florida State University to learn that one of the biggest clubs in the world wanted to sign her. She jumped at the chance to join the Women’s Super League (WSL) club in February 2016 and was eager to impress straight away, but a series of setbacks would rule her out for over a year. The most serious damage required ankle reconstruction surgery and eight months of rehabilitation. Meanwhile, Campbell’s City team-mates claimed a domestic double that season as she watched on from the sidelines. Countless hours in the gym were required and the full-back admits some days were more frustrating than others. With that ankle injury, I did find it tough at times,” Campbell said this week. “You’re staring at the same four walls for the longest time and the girls are going out to train while you’re stuck in the gym. Managing to regain full fitness in time to put herself in contention for the FA Cup final last May, Campbell was expecting to be named on the bench at best but manager Nick Cushing showed his faith in the Ireland defender by handing her a surprise starting berth. And, in front of 35,271 fans at Wembley Stadium, she provided two assists — one of which was a pin-point cross for two-time Fifa World Player of the Year Carli Lloyd — as they overcame Birmingham City 3-0 to lift the trophy for the first time and complete a domestic treble. With her long-running injury problems seemingly behind her, Campbell began Ireland’s World Cup qualifying campaign in outstanding form. As first-choice left-back under manager Colin Bell, the 24-year-old was a stand-out performer in the opening 2-0 victory away to Northern Ireland. Her trademark long throw-ins caused real problems and one resulted in an own goal for Rachel Furness, while the full-back curled the second in from 25 yards to seal the three points. Then, just days after losing her grandfather — renowned musician with The Dubliners Eamonn Campbell — she was excellent in the win over Slovakia last October and had a hand in one goal as the Girls in Green obtained two wins from two. 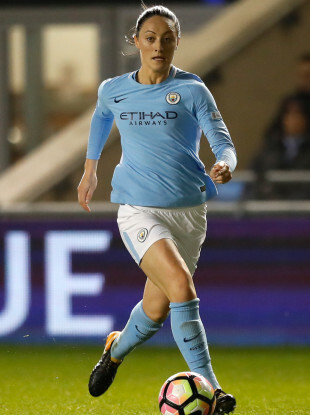 With an away trip to face European champions the Netherlands on the horizon, the defender lined out for City in their Women’s Champions League last-16 tie at home to LSK Kvinner of Norway in November. After an innocuous challenge early in the second half, a stretcher was required to carry her off the pitch. You could sense it was serious. Results showed Campbell had ruptured anterior cruciate ligaments (ACL) in her right knee. It was a cruel blow but she appears to be extremely strong mentally and even sounds upbeat about the future. Campbell adds: “I’ve been through serious injuries before. I’ve done my ankle and my foot so it’s not something that I’ve haven’t come back from. I know it’s part and parcel of the game, you’re going to get injuries — some more than others. “I’m unfortunate enough to have got this but I’ve done it before and I’ll definitely be able to do it again. Back in the day, if you did your ACL you would have been out for a long time and it could have been career-ending. Surely it must be even harder when Ireland are doing so well in the World Cup qualifiers and Man City sit top of the WSL though? “Yeah, it’s definitely frustrating as a player when you’re watching on,” she replies. “You’d rather be on the pitch than in the stands but I’ve been in the stands more than I’ve been on the pitch recently. “It’s tough but I’ve been there before and I’ve come back from it. I was out with my ankle for eight months and I came back and played at Wembley — a game which I didn’t expect to be involved in at all if I look back on it now. They started me and put their trust and faith in me. Without Campbell, Ireland earned an incredible result away to the Dutch — holding the reigning European champions to a 0-0 with a gritty backs-to-the-wall display. Englishman Bell has brought new confidence and a winning mentality to the group, while the strike over working conditions last April means there’s a real sense of togetherness in the squad now. “I think the belief that we can qualify, that it doesn’t matter if you’re 16 or 25, you’ve got a great importance to the team,” Campbell says, when asked what’s different under the current management team. “We know we can qualify if you do everything right on and off the pitch, and if we are together as team-mates. I think the gel we have now as a squad is second to none. With their eyes on a first-ever World Cup qualification, Ireland are in Portugal this week for a couple of friendly matches ahead of a double-header of qualifiers at home to Slovakia and the Dutch in April. Campbell is still only 24 but, having made her debut back in 2011, she has become one of the more experienced players due to an influx of young talent in recent times — Tyler Toland (16), Leanne Kiernan (18), Roma McLaughlin (19) and Amber Barrett (22) to name a few. “I do feel myself taking a more senior role, whereas previously I would have been a lot younger. There were the likes of Emma Byrne, Ciara Grant and Yvonne Tracey, who I would have looked up to. “I know that the 16 and 17-year-olds are coming in and some of them are looking up to me. It’s my job to make them feel comfortable and to make them understand their role in the team — that they are a vital part no matter what. Injuries aside, she feels blessed with how her career has panned out after opting to move to the States to study social science following spells with Boyne Rovers, St Francis and Raheny United. “I’m at the best club in England, I know that for sure,” she declares. “It’s phenomenal when I look back on it now and even chatting with mum and dad, we still can’t believe that I’m at a club like City and I’ve been given this opportunity. The road to recovery is a long one but Campbell is confident that she can be back out on the pitch in time for Ireland’s final qualifier — at home to Northern Ireland on 31 August. I do have a target in mind,” she says. “The girls have done phenomenally and drawn away in Holland. I think we have a great shot at qualifying for the tournament next year in France — through the play-offs or even out-right. Email “'I’m in the best place to recover at Man City so it’s definitely not something that will end my career'”. Feedback on “'I’m in the best place to recover at Man City so it’s definitely not something that will end my career'”.